To continue the festive celebrations, Vietjet has announced a three-day sale with one million tickets available for as little as S$0*. Tickets are now available for purchase until 11 January 2019 between the promotional hours of 1:00 pm – 3:00 pm (GMT+8). The promotion applies to all international routes between Vietnam and Singapore, Seoul, Busan, Daegu (South Korea), Hong Kong, Kaohsiung, Taipei, Taichung, Tainan (Taiwan), Bangkok, Phuket, Chiang Mai (Thailand), Kuala Lumpur (Malaysia), Yangon (Myanmar), Siem Reap (Cambodia) and Tokyo, Osaka (Japan). Tickets are valid for travel between 14 February 2019 to 31 December 2019. For the routes between Vietnam and Japan, promotional tickets are available all day from 9 January to 11 January 2019. Tickets for this sale are available on www.vietjetair.com (also compatible with smartphones at http://m.vietjetair.com) or www.facebook.com/Vietjetglobal/ (just click on the ‘Booking’ tab); payment can be easily made with debit and credit cards of Visa/Mastercard/AMEX/JCB/KCP. 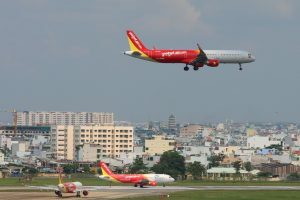 The promotion is part of Vietjet’s latest campaign, ”Love Connection – Love is Real Touch”, which connects loved ones across the region including destinations such as Vietnam, Japan, South Korea, Taiwan, Thailand, Singapore, Malaysia, Cambodia, and China.